Fast Change Lube & Oil’s Operation Soldier Care Program Raises Thousands To Send Care Packages To Deployed Soldiers – Fast Change Lube & Oil, Inc.
Fast Change Lube and Oil donated $30,000.00 to Military Missions, raised through Its 4th annual Fast Change Operation Solider Care program, Friday, October 26, 2018, at Military Missions headquarters in Lexington. Fast Change Lube and Oil teamed up with WEMM Radio in Huntington, WV in an effort to support the U.S. deployed troops. Fast Change customers at all 20 Fast Change locations, gave monetary donations as well as donating care items. 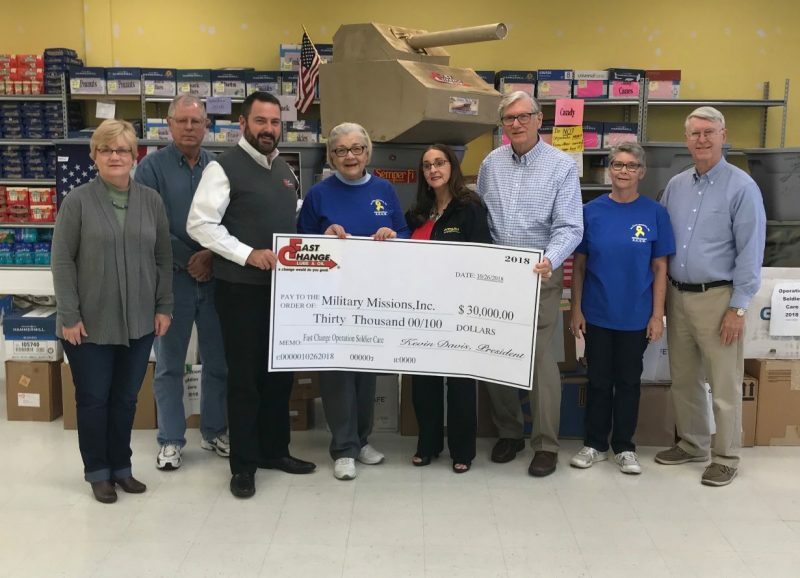 With the help and support of loyal customers and the Fast Change team, Operation Soldier Care more than doubled last year’s donation of $11,000.00. All of the funds to Military Missions will go to sending care packages to deployed soldiers. appreciation and gratitude to the men and women who are providing safety for all of us. Karen Weaver, United States Air Force Veteran, has volunteered with Military Missions for 6- years. She says she has walked more than a mile in the shoes of a soldier and she lets that be her driving force to volunteer. Weaver commends all who support Military Missions in any form. She has been at the Fast Change Operation Soldier Care check presentation for the last 3 years. U.S. Veteran and longtime volunteer, Fred Doster says Military Missions, INC. sent over 8300 care packages to active duty military members last year and he expects that number to rise this year. As an ongoing token of our gratitude and appreciation, Fast Change honors active military personnel and veterans with discounted services at all 20 Fast Change Lube and Oil locations. For more information on Military Missions or to request a care package for a deployed soldier or to become a volunteer, visit https://military-missions.org.